Thereâ€™s no doubt in my mind how this book became a New York Times Bestseller. This is the most important non-fiction title Iâ€™ve read in years, and I suggest that everyone, EVERYONE, EVERYONE read it. We are all going to die, or will have to deal with the death of someone close to us and this book helps us come to grips with the harsh realities of what it takes to deal with the disposal of physical human remains. 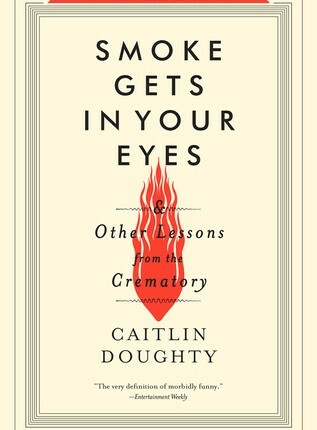 Caitlin Doughty walks us through the story of her life after she chose to seek employment in a San Francisco Bay Area crematorium. Sheâ€™s a young, beautiful woman, the type that does not seem who would want to get up close and personal with the disposal process of dead people. The pace of her storytelling is compelling and the language she speaks with is both alluring and captivating. Trust me, you will not be able to put this book down. There will be times when you may want to put it down, or will need a break because the details she goes into are so gritty at times that youâ€™ll need a chance to catch your breath or let the images she creates in your mind have time to settle down. But I believe, even for readers who do not have an innate sensibility for the macabre, everyone will find this hard-pill-to-swallow story full of information youâ€™ll be glad to know about for when the fateful days of dealing with death come upon you. She presents the story from both sides of the fence. She describes what her experiences were like learning how to work in a crematorium, but she also talks in explicit detail about what itâ€™s like for the public who are bringing their dead to her. She is incredibly sympathetic about the feelings that the grieving suffer from, but never blinks an eye when it comes to the grim tasks she must carry out for them. I had a chance to meet Caitlin when she was doing a book signing for the paperback release of her book a few months ago, and her personality is so brimming with confidence and enthusiasm because she is a rare being that has definitely found her calling in life. I can see that many people that might not have known that they too could have a calling in this field could now become brave enough to investigate the career field more deeply because of how lovingly she has described the career field with her book. More essentially though, she has made the facts about what normal citizens must be ready to deal with when the fateful day of dealing with the death of a loved one occurs. Also, we can all be more aware of the choices we can make for our the processing of our own bodies after we die. How wonderful it is to be able to make these choices and preparations for ourselves in advance, rather than force these decisions upon our shocked and frightened loved ones. Caitlin’s also become a great proponent of celebrating the beauty of death and has a website called The Order of the Good DeathÂ where the discussion her book starts is continued in regular blog postings. Â A couple of years ago she did an “Ask Me Anything!” on Reddit. Caitlin has also become a social media superstar and can be reached via Twitter and Facebook, as well as seen below on YouTube!